Last month I blogged about the complexity and confusion about family ‘rules,’ using stories about the Royal Family as a segue into this often troubling topic. I was pointing out how rules get passed down from generation to generation and these generational, cultural and gender differences can lead to relationship problems. • maintaining comfortable closeness and distance. • ways of coping with stress. • respecting needs for privacy and personal space and boundaries. Serendipitously I received a request for an interview from Ariana Huffington’s new well-being site, Thrive Global. And a huge influence of how we handle rejection and disappointment in the workplace is based on spoken and unspoken messages that we learned in our family. Let’s take a look at how these generational family messages influence our interactions. You are having a meeting with your manager or co-worker. You open your mouth to say something and someone else’s words come out. The words or tone seem to take on their own powerful energy. What just happened here? Well, first of all, there are not just two people in the room. Each of you has several people sitting on your shoulders—parents, siblings, grandparents, aunts, and uncles, teachers. And every one of them has to have their say, each has to get a word in, or an opinion, or a judgment or advice. And you may find yourself sitting in that meeting, opening your mouth and not having a clue where on earth these words came from, but it sure sounds like something Grandma would say. Or Mom or Dad or your coach or that critical 4th grade teacher. Because each participant’s family is floating around the office, the room can get crowded by all the thoughts and beliefs of each family member wanting to put in his or her two cents’ worth to liven up the discussion or negotiations. Again, all those old messages and influences need to be recognized and identified and booted out to make room for the thoughts and words of the two people involved. Our families learned their “ways” via cultural influences going back many generations, affecting beliefs and values, comfortable closeness and distance. Our frame of reference is our cultural upbringing. Cultural experiences can create different styles that lead to misunderstandings and taking things personally. For example, families of various ethnic backgrounds may show caring and connection to others by raising their voices, by nagging, through food, by doing favors to curry favor. Let’s look at “culture” as meaning gender attitudes, ethnicity, country, area of the country, and even our city and neighborhood. All of these factors can influence how we think about time and space, our comfort zone, and how we learn to balance closeness and distance. Let’s classify these variations as “style differences” and take a look at how they influence our work environment. I find it’s usually more a matter of not understanding cultural expectations of privacy and space. For example, what if someone of German or Dutch descent is sharing work space with someone whose family originally came from Japan? German and Dutch houses tend to have thick walls and double hung doors, insuring quiet and privacy. What about doors in Japan? Yes. Paper sliding doors. Can you can see how there night be privacy issues her where one person may be more sensitive to intrusions then the other? I’ve heard clients describe growing up where having their own space was essential, they often retreated behind closed doors and kept involvement with family members to a minimum. Even though your family may have immigrated decades or even centuries ago, the cultural expectations and ways of doing things tend to travel through the generations. Sometimes they are unspoken messages, copied by example. Another difference of style learned in our families has to do with whether conversations are clear and direct or general and vague. Maybe your families style was to encourage defined agreements, with a beginning and end. Or, maybe their style was to be casual, unplanned, noncommittal. Trying to discuss or negotiate with a co-worker or manager with a different communication style from yours can be maddening. Asking Questions: Encouraged or Forbidden? Some of us grew up in a family where curiosity and asking questions was welcomed or discouraged. I hear stories that in some families asking questions was even forbidden. One man I know was afraid to ask his manager to clarify things and pretended he understood how to approach a task or project when he really didn’t. The reason? In his family if he asked a question the response was, “Are you stupid or something?” So at work he was petrified someone would think he was stupid so he avoided clarifying. Instead he was spending enormous amounts of energy trying to figure things out and worrying about how he might screw up. There are lots of stories in Don’t Take It Personally! The Art of Dealing with Rejection about how family messages color our workplace situations including poor communication leading to misunderstandings and taking things personally, the need to appear perfect, struggles about asking for a raise or to be assigned a certain project, or promotion, excessive worrying about an imagined negative outcome, feeling left out of peer socializing, unrealistic expectations that lead to huge disappointments that feel like rejection. So Where Do These Messages Come From? When we consider the backdrop of early experiences, beliefs, and rules, the meanings and intentions of present interactions become clearer. Situations at your job may replicate your very own growing up experiences. You might have to work with someone who ignores you, or insults and bullies you, or does not treat you fairly. So you may find similar issues coming up at work that you experienced growing up—things such as loyalties and betrayals, secrets, alliances and coalitions, and communication deviances. You may find yourself reacting the way your family “taught” you to react. Where exactly do these generational messages come from? How can you learn to recognize them, especially the subtle ones? 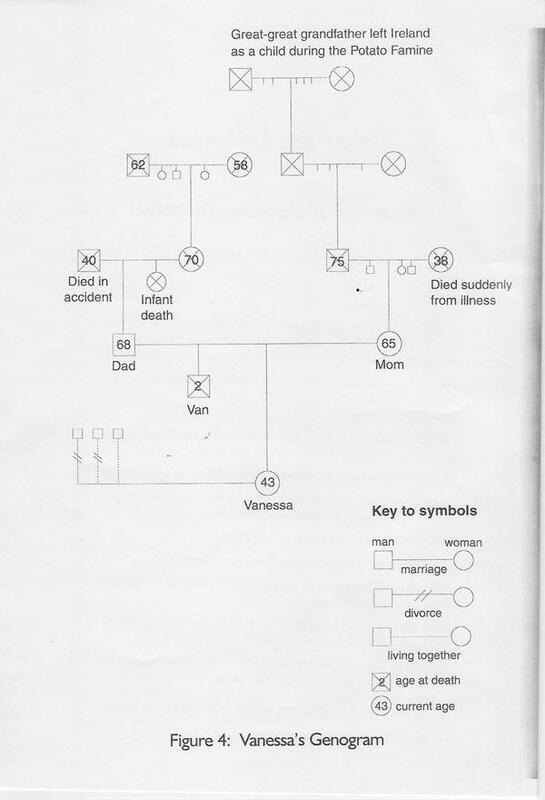 I often do a genogram with clients to look for family patterns. In this family diagram it’s helpful to go back three generations, even if names and details aren’t known. This isn’t a diagram of history like a family tree where you look for dates and historical facts; it’s diagram of repetitive patterns and family messages that get passed down from generation to generation. I like to try to go back three generations. Because of my interest in how fear of rejection affects personal and work relationships, I tend to look for patterns of acceptance or rejection messages that might have been passed down. This includes the unavailability of parents due to work priorities or substance use or separation/divorce. It includes family “scripts” such as good/ bad, success/failure. Other messages passed down are personal safety issues, trust issues, guilt feelings and anger. It includes the necessity of leaving their county because their life depended on it or being forced coerced to leave. And then we can look for various patterns of abandonment, such as chronic illness or early deaths or sudden moves by parents. When we did a genogram, one man discovered a pattern of disownings that took different forms throughout the generations. He’d had no idea such occurrences happened in his family. No wonder her felt so unappreciated and unsupported at work. –– Work toward developing clear respectful communication, avoiding misunderstandings. Yes, even though I know it can be difficult, I encourage and coach my therapy and workplace consulting clients to practice asking questions to make sure they are clear about someone’s meaning. “This is what I heard you say ____________________. Is it what you said? –– Try to respect differences rather then feel threatened by them. –– If a meeting or discussion starts to feel weird or overwhelming, take a “time out” to collect your thoughts. 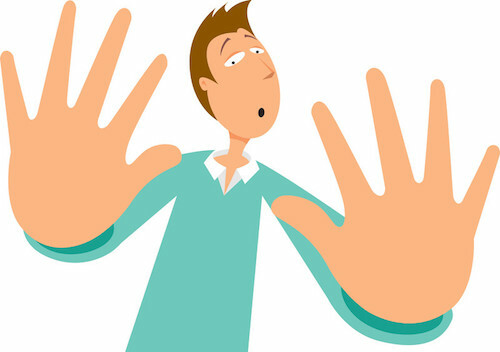 Excuse yourself, saying, “I’ll be back in a moment.” Go down the hall, get a drink of water, take several deep breaths, and regain your composure and balance. Counting to ten helps a lot. And taking ten slow deep breaths along with the count helps even more. Ten long seconds does a lot toward taking the charge off. –– Separate the “then’ from the ‘now.” Try to remember to remind yourself that the person in the room with you is not really your Dad or Aunt Sally or Uncle Sam or your brother or sister or teacher or coach. –– Try to keep one foot out of the quicksand. Stay in the present instead of letting the past swallow you up. –– By “walking alongside yourself”and mindfully noticing you can be more objective about yourself and the situation. And ‘mindful’ means without judgement. Notice your patterns of behavior and what they lead to. Notice the response of others to you. Let me know if/how I can be helpful to you in this process. Would love to hear your thoughts and ideas . . . The attribution should include this information: Elayne Savage, PhD is a communication coach, keynote speaker, and trainer, practicing psychotherapist and author of Don't Take It Personally! The Art of Dealing with Rejection and Breathing Room - Creating Space to Be a Couple.